Ever look at a Christmas present you just wrapped and think “Hmm, that’s a little plain”? 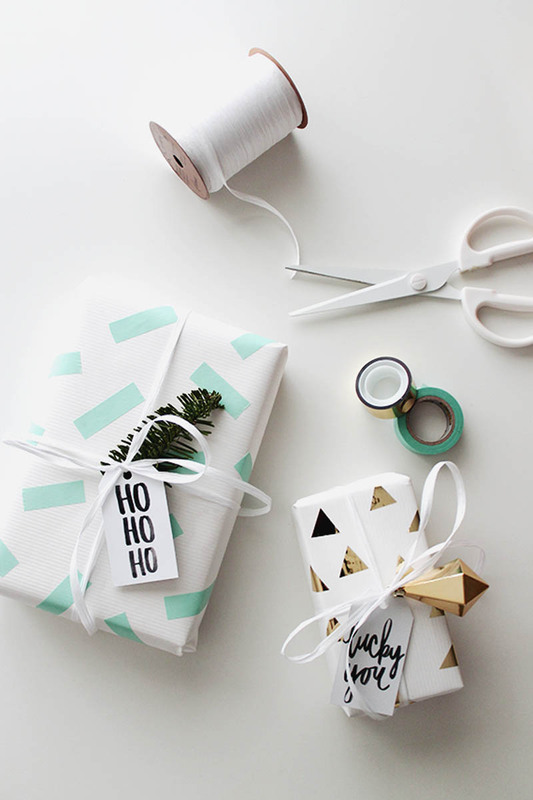 Dress up your Christmas gifts this year with these creative gift wrapping ideas! 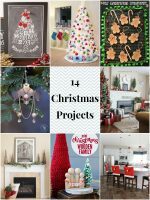 These great ideas are all simple and easy to do, and very inexpensive! It’s just one of those crafts that just works! 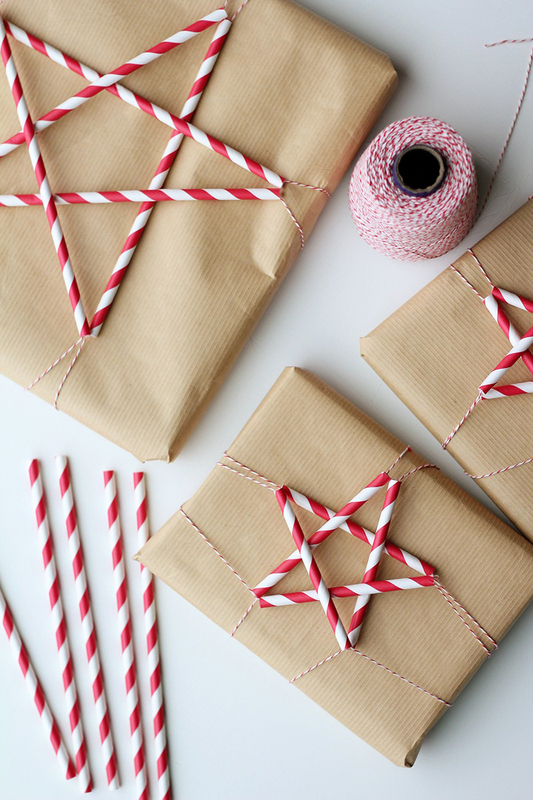 If you’re sick of the same old boring ribbon, this star fashioned from candy cane colored paper straws will become the crowning glory of your gift. 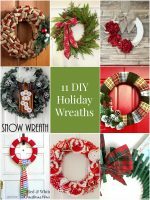 It’s inexpensive and perfect for repurposed Christmas decor. See the full instructions on Splash of Something. 2. 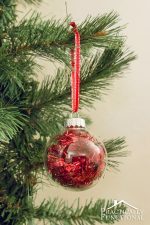 This little pine tree makes a great holiday and winter companion! 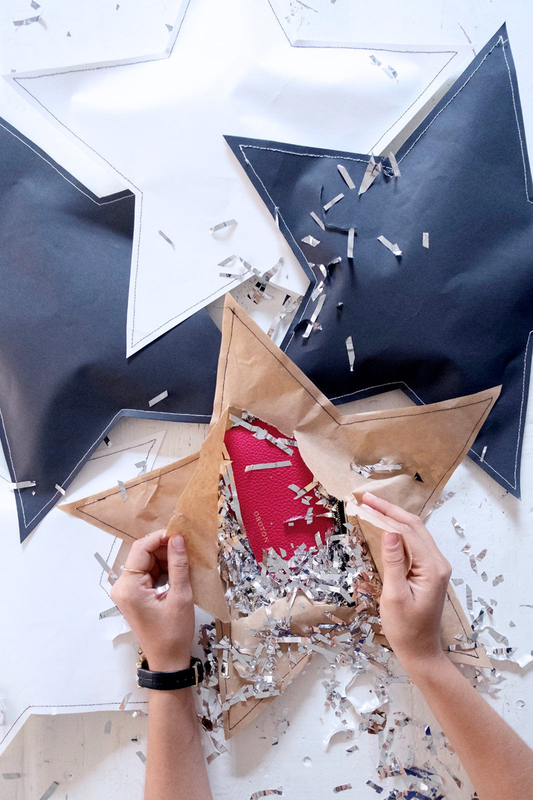 This clever wrapping idea is a lot of fun to make, at least for those of us who like carving and playing with ink pads. 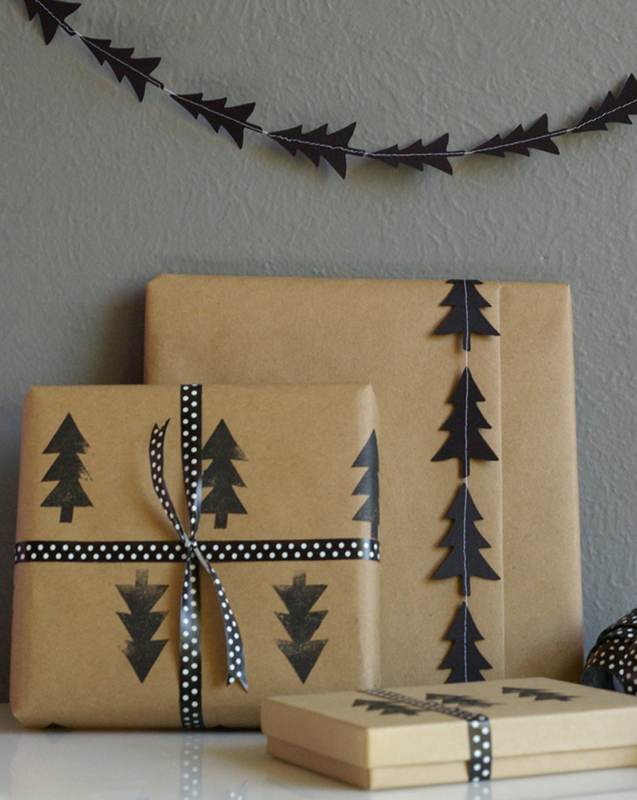 Make your own DIY black tree garland and stamp your wrapping paper in a similar pattern this year. 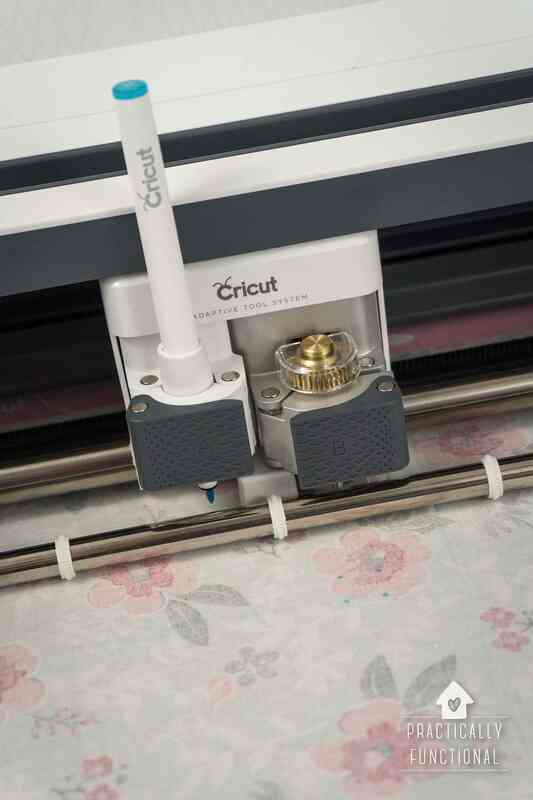 Take a family photo, your favorite picture from vacation, or a special message, and turn it into wrapping paper to create lovely personalized gifts. 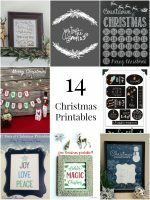 Another idea is, instead of adding a gift label, this photo wrapping paper can also be personalized to whomever the gift is for. See the full instructions on Capturing Joy with Kristen Duke. Ordinary folk will see cupcake liners and pass right on. Extraordinary people save all the cupcake liners they find with beautiful patterns on them because they need them to wrap a gift. Right?! 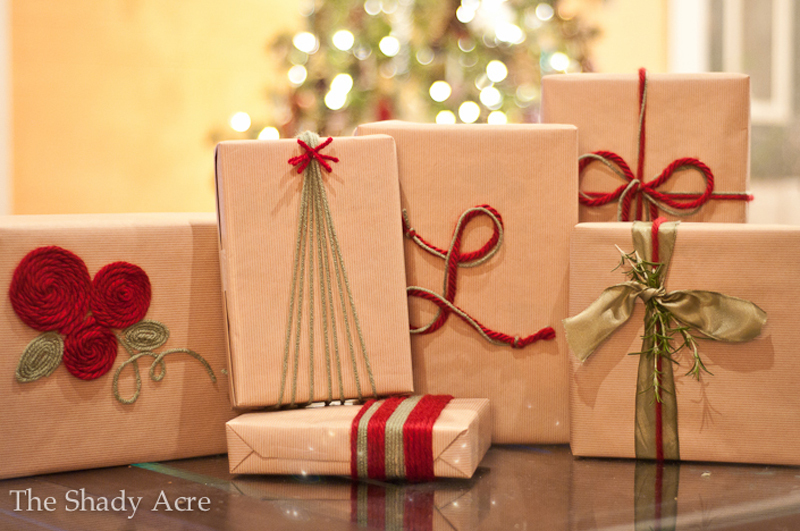 Placing these presents under the tree will bring a whole new meaning to “merry and bright”. It’s really simple to make and you can just pop in a cute gift card to finish, pow! See the full instructions on Boxwood Avenue. 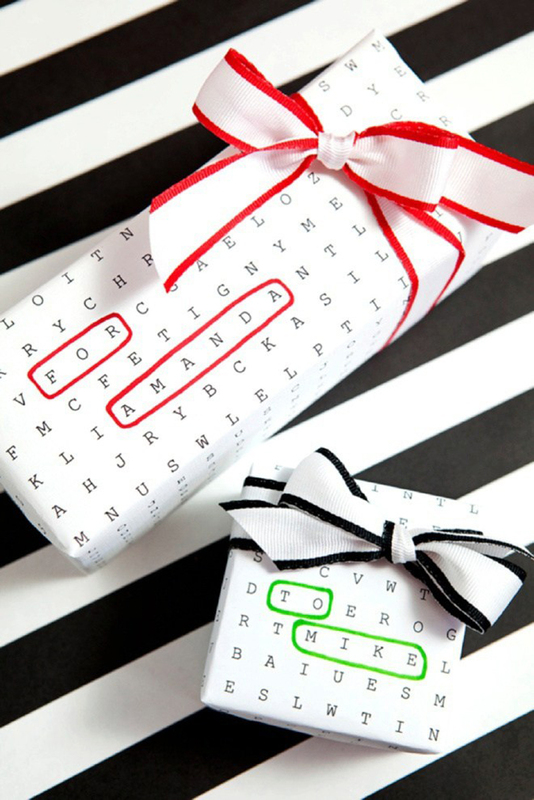 Send a special message with every gift you wrap with these word search wrapping papers. No labels required! See the full instructions on Something Turquoise. A simple and minimal wrap is like a gift within itself. 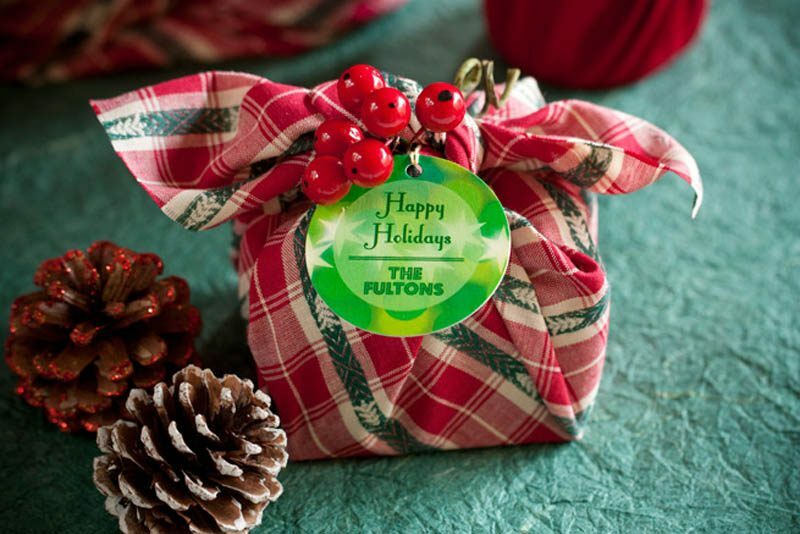 Use stockings to wrap the gift; tie with twine and slide in a sprig of evergreen. 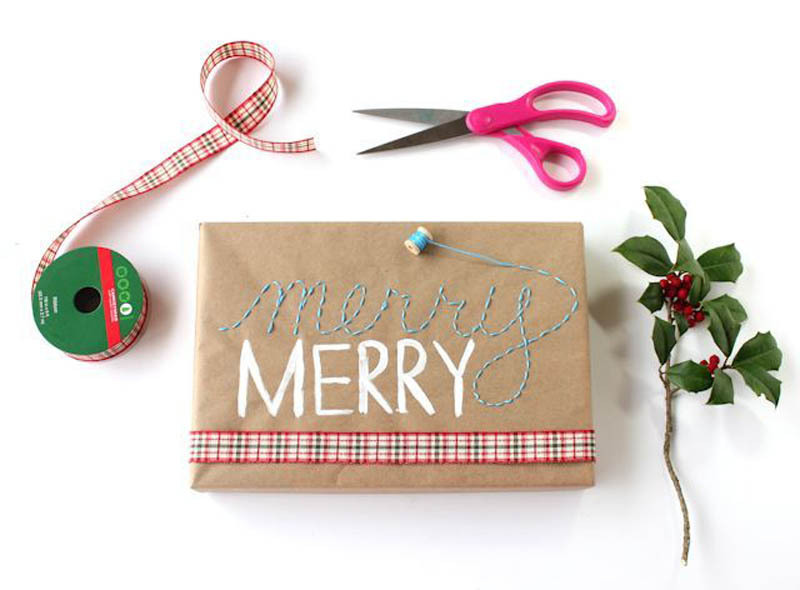 If you’re feeling adventurous in your gift wrapping, use yarn to make creative patterns and bows. The more handmade looking, the better. See the full instructions on The Shady Acre. Sparkle up your gift boxes! 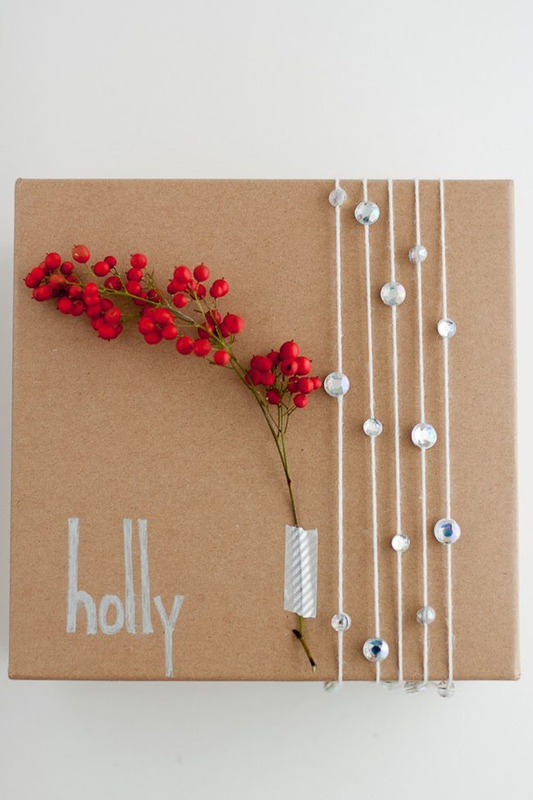 Take an ordinary jewelry box and coat it in silver glitter. 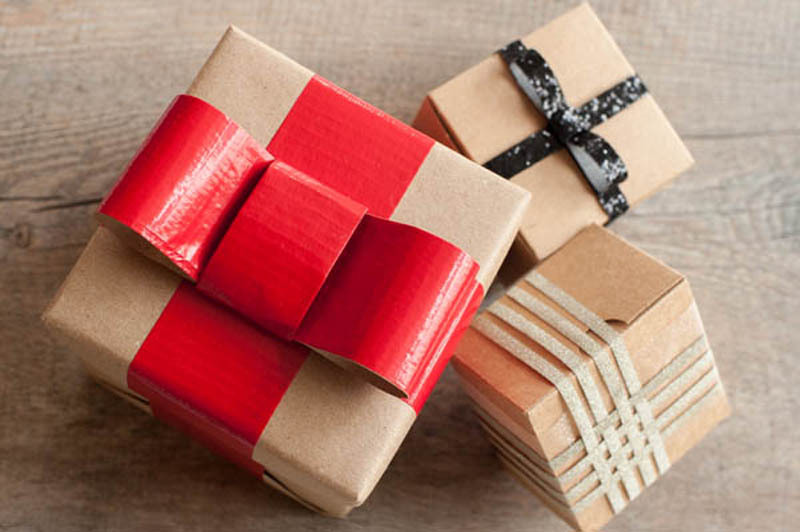 Make these boxes to perfectly wrap gift cards, money, or beautiful jewelry. See the full instructions on For the Makers. 10. Top your presents with grace and a bit of sparkle! 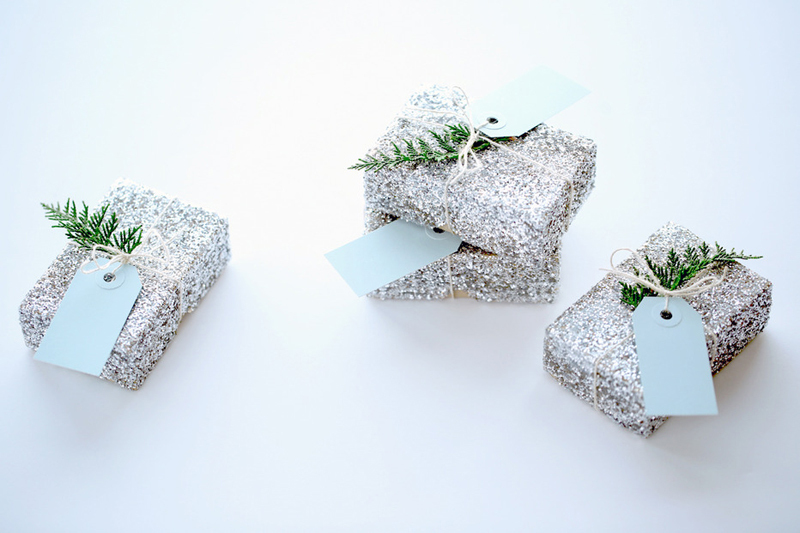 To help make your gift wrapping pop, use gems to add a little bit of sparkle. Add names and any red accessories for more impact. See the full instructions on Flax and Twine. We absolutely love this contrast of old fashioned brown paper with all the glam gold glitter design. As you can see, glitter has the ability to make anything look a tad-bit more exciting. 12. 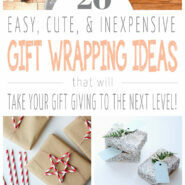 Minimal materials, maximum wow factor with this easy DIY stitched up gift wrap! It’s really quite sophisticated and dramatic — a nice change from traditional gifts. And the best part is ripping them open! See the full instructions on A Pair & A Spare. 13. 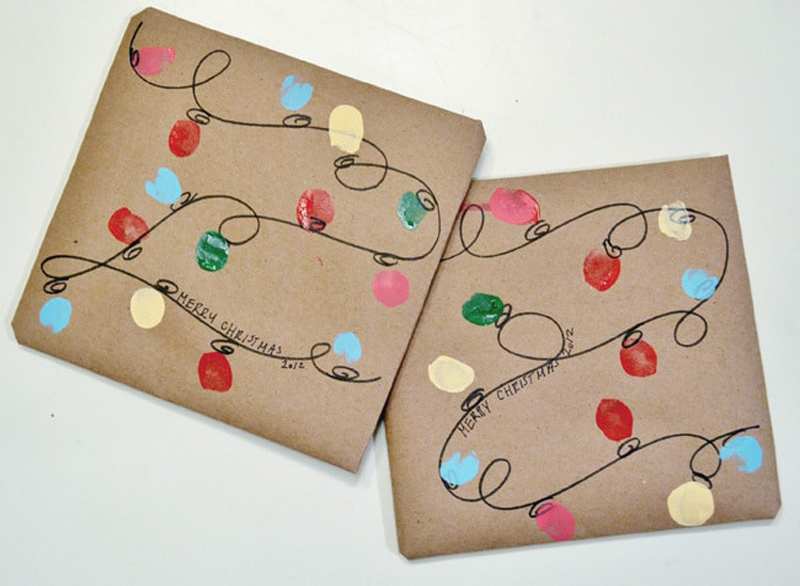 Turn your kiddo’s fingerprints into a holly jolly holiday lights gift wrap! 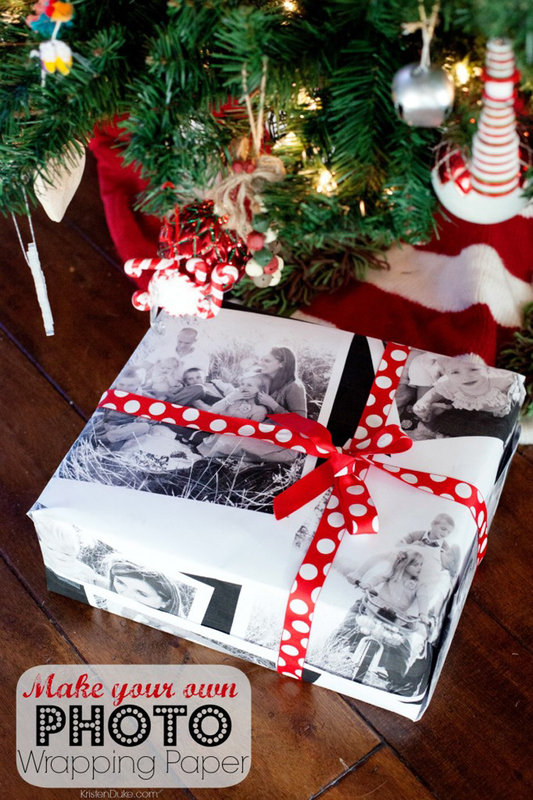 Try this personalized gift wrap idea that’s perfect for the kids to make themselves! Putting a smile on the faces of grandparents, aunts, uncles, and anyone else who receives these adorable creations is truly priceless. See the full instructions on Burlap and blue. You can now find tons of pretty glitter ribbons in the stores right now. Try to come up with alternatives to plain ribbon by going for metallic or sparkly fabric types! 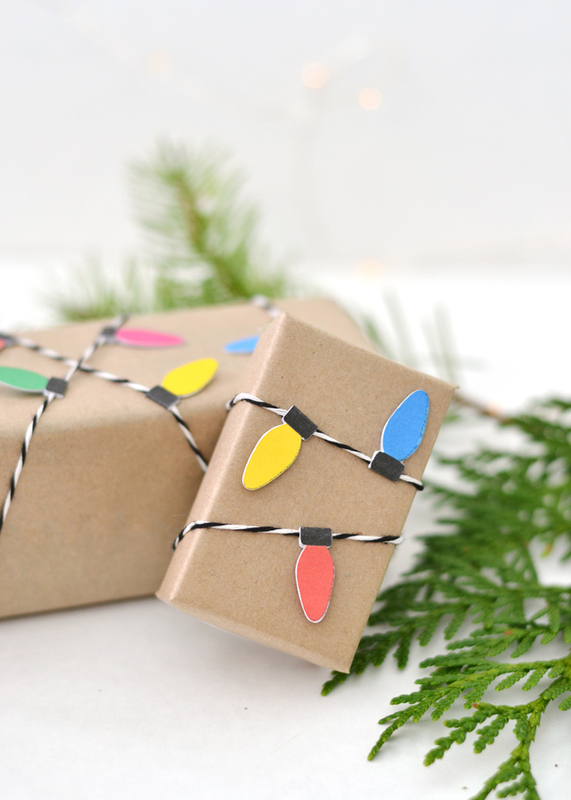 Bring some and try this wrapping idea. See the full instructions on The Sweetest Occasion. 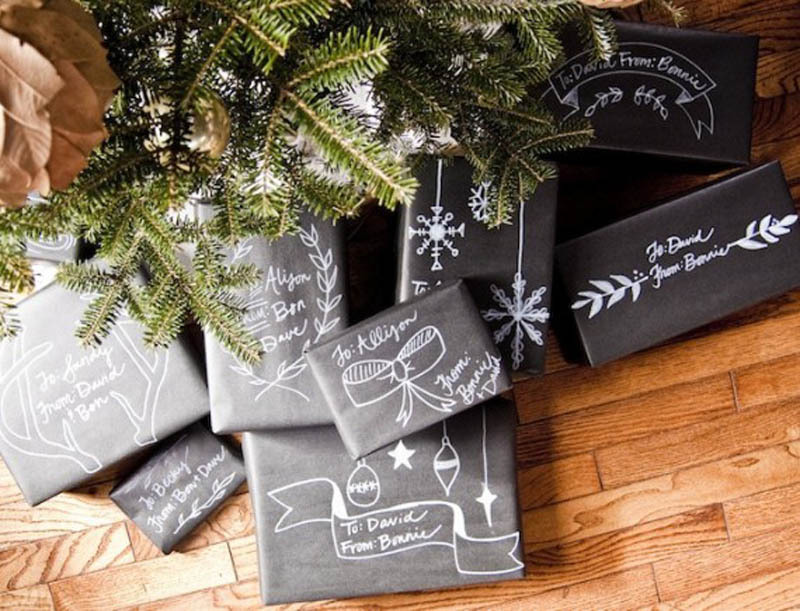 All you need is a roll of chalkboard paper and chalk markers, get creative and draw whatever custom design you want on it. Tada!!! See the full instructions on Going home to roost. 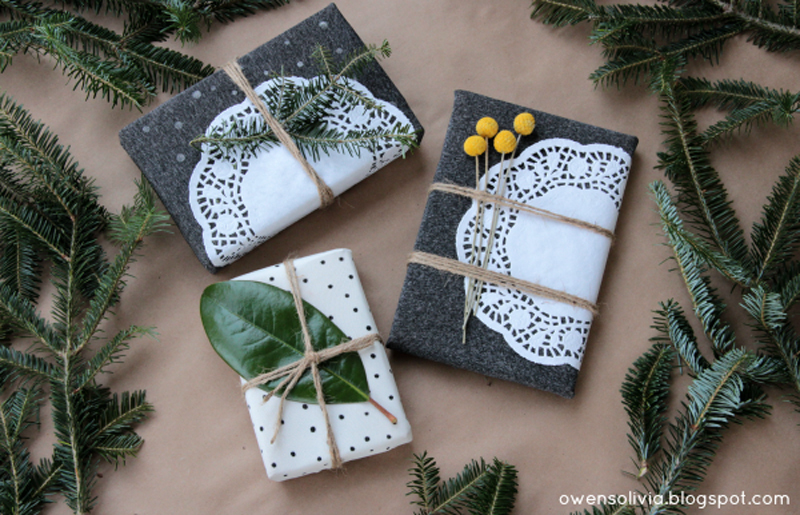 Instead of struggling with wrapping paper this holiday season, get yourself some cloth. The Japanese Furoshiki technique can wrap anything easily and make it look good. It’s especially useful for wrapping oddly shaped gifts. See the full instructions on Evermine. 17. 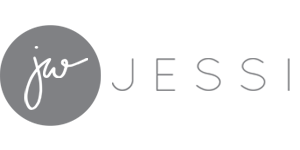 For a touch of minimal and modern style try using washi tapes! 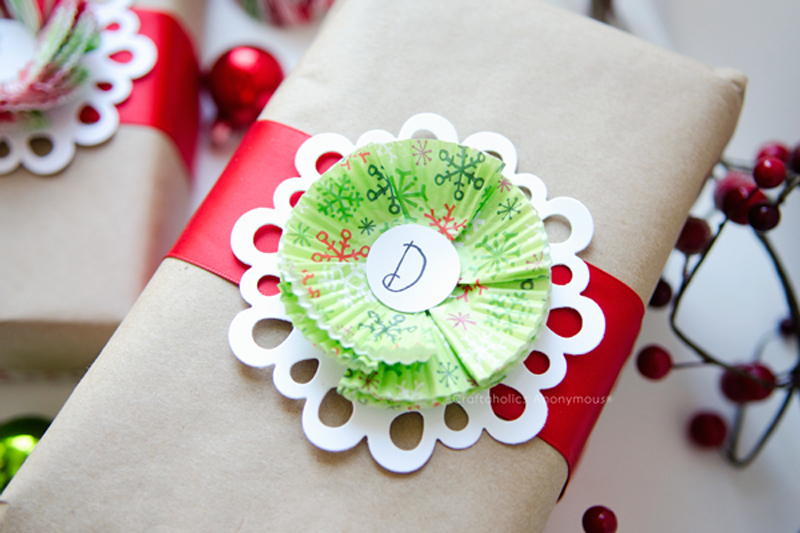 Make shapes and designs using washi tape to jazz up your plain wrapping paper. All you have to do is just cut and stick! See the full instructions on Almost Makes Perfect. If you’re giving a really important gift, try your hand at stitching for a unique look and personal touch. Just remember, it’s the kind of wrapping paper that you open veeeeeery carefully! 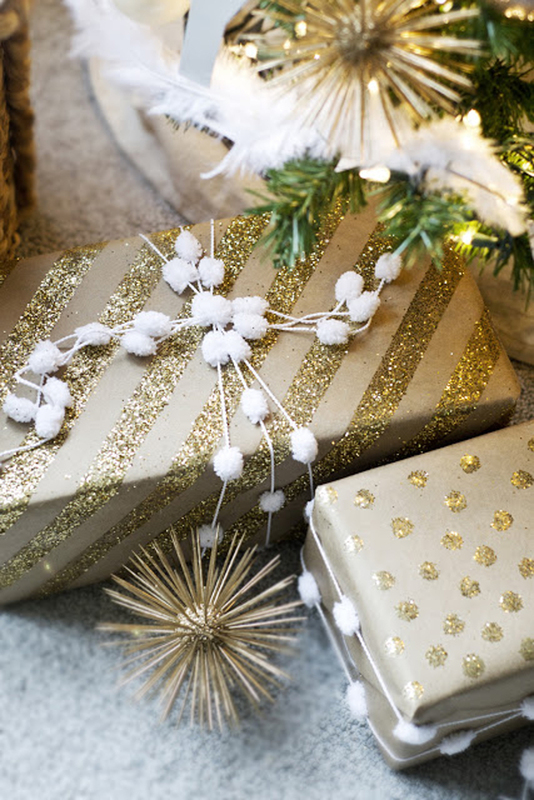 You might not want to open a gift wrapped like this; it’s too pretty! 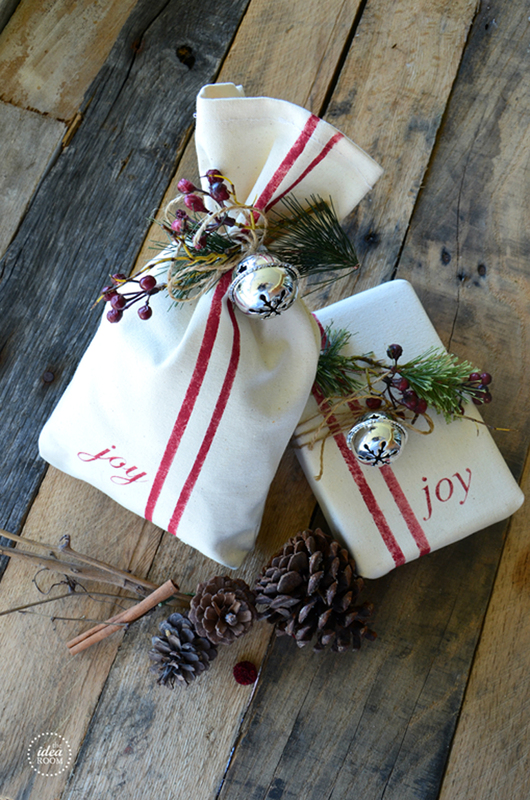 Create your very own bags with drop cloth to wrap presents, or use them for your holiday decor. See the full instructions on The Idea Room. Gingerbread cookies can be used for more than just your cookie swap. From holiday to decorations to edible gifts, it’s all possible! 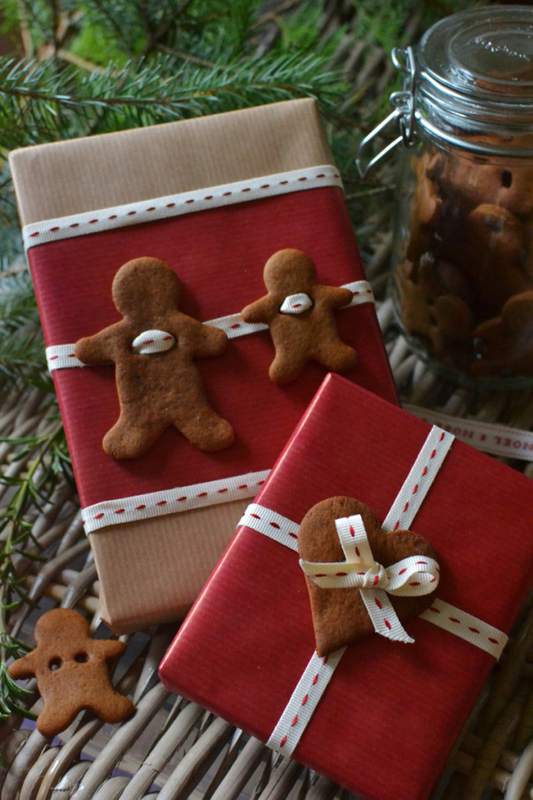 Don’t worry, these gingerbread biscuits will hold up until Christmas morning. See the full instructions on Decorator’s Notebook.